This is the outfit I wore to the Daily Mix launch on Monday! Daily Mix is basically a collab sort of channel with a bunch of the UK's top Youtubers which produces fresh content 5 days a week. Like I mentioned yesterday it was really fun and lots of drinks and dancing were had! I really liked the mixture of the dressy skirt with the slogan tee. I was going to wear a Metallica tee (geddit, metallics) but I decided to go with this one instead. The dress code was dress to impress but I didn't want to over dress as I'm never sure how dressy dressy is supposed to be. So I compromised with the snazzy skirt instead. It cut my arms to pieces to the point where it looks like I've been attacked by a cat or something but it was worth it! Compared to the essay I wrote yesterday this is relaively short! I'm off to go to a Topman pop up event and I havent even sorted my hair or my makeup out as I shot these images on Tuesday! Argghhhh…. Love the gold skirt, very festive! You look lovely! gorgeous! 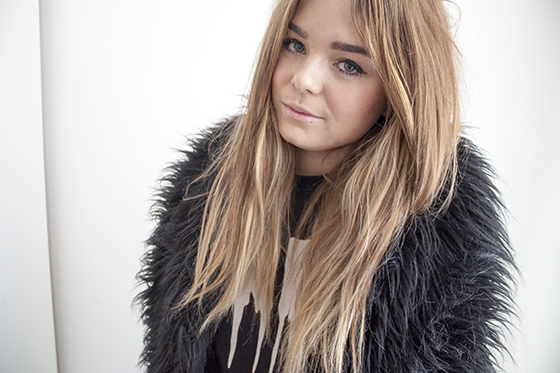 loving the furry collar coat! Wonderful. I love your skirt. The top and skirt combo are lovely together! Dont usually like metallics but the skirt is just so nice and christmassy! Lovely skirt, very festive < agh I hate using that word. Love your skirt babe! I've been looking for a cute sequin skirt that isn't bodycon, this one looks perfect! Gorgeous! Like a Hollywood actress! :) LOVET lily! Love the skirt and T-shirt combo! I love the contrast of the grungy top and gold skirt!